Hello all! My name is Margiree Palmer. I am a senior social work major at Trinity Christian College. This semester I am interning at New Moms a non-profit agency that serves young moms between the ages of 16-24 located on the west side in the Austin community. I work with the workforce development team, which helps the moms find jobs as well as develop the skills needed to stay on these jobs. I am learning so much from this experience, and I am enjoying it! 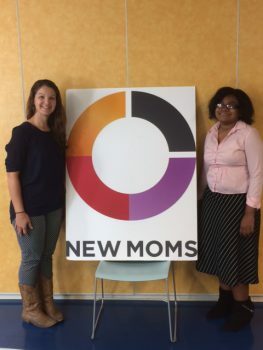 New Moms seeks to serve young mothers needing a little support through three main programs; the housing program, the workforce program, and the family supports program. The three programs all have the same goal in mind “to share the love of God by surrounding young moms and their children with everything they need to transform their lives.” This is the mission of New Moms. They focus mainly on five core values; love, grit, hospitality, empowerment, and possibility. These values are evident throughout the agency. Seeing the impact of these values among the moms is truly enhancing my thinking and knowledge not only in the social work field, but in everyday life as well. I am learning so much from both the staff and the participants of New Moms, I am grateful for the opportunity to intern at New Moms. om, I just wasn’t quite sure what it was. Now I can say that I am so glad that I am a part of Chicago Semester. I am experiencing new things I probably would not have been able to experience otherwise. I have visited neighborhoods I had not previously seen and tried different food, and there is still a little time left in the semester to experience more new things. I am learning more about myself as I interact with people, and as I am now working full time for the first time. Through this experience I am definitely gaining a new perspective on the field in social work. It is one thing to read in text books or even to have service learning opportunities related to the field, but it is different working in the field every day during this semester. It is even more amazing to see an area that I am so familiar with being impacted by the work being done at New Moms. Both Chicago Semester and New Moms are shaping me as a person, and as a future social worker.